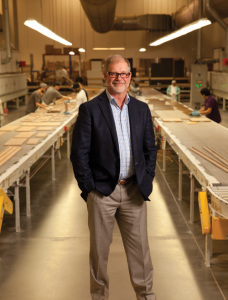 Manufacturing Executive of the Year - Excellent Cultures Inc.
Steve Bell, President & CEO of Bellmont Cabinet Company started his company in his garage in the 70’s and built it into a 200-employee, $30 million-a-year maker of high-end cabinets. Then he had to rebuild it again when “the high-rise business went away” with the recession and revenue plunged 60 percent. His sons are now a key part of the Bellmont tradition as it now reaches to almost 300 employees. Steve Bell | President & CEO | Bellmont Cabinet Co.
Tyler Bell | VP of Sales & Marketing | Bellmont Cabinet Co.
Bell’s employees share those lessons about resilience through a project in which the firm sends workers and resources to help build a village in El Salvador, adding homes, a school, a water system and electricity. “It’s been as rewarding for our companies and our employees as it has been for the community,” Bell observes.